I have been approached by webinar providers to put together presentations about topics in the incentive industry. I have also put together presentations for potential clients, current clients and internal training purposes. All of these presentations were designed in Microsoft PowerPoint. Description: I was originally asked to be a speaker at the Home Baking Association Annual Conference in Charleston, South Carolina in September 2015. This presentation grew out of that speech when I was asked back by the FCCLA to present at their annual meeting just a few months later. Individual FCCLA organizations would be updating their websites in 2016 and asked for tips on making the process as smooth as possible. Description: While filling in for a sales person out on maternity leave, I identified the need to create a power point presentation for the initial stage of the demonstration process. Demonstrations were being conducted live for each potential client and the slides helped to get everyone acclimated to the company and services. 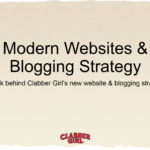 It doubled as a deliverable to send after presentations as a great reference tool. Description: Much has changed in the way of employee incentive programs over the past couple of years! 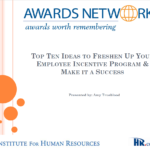 In this webcast, you will learn about ten different ways to improve your current employee incentive program and make it more successful. If you are thinking about starting an employee incentive program, then you will learn about the top incentive trends you can take advantage of while setting up a new program. 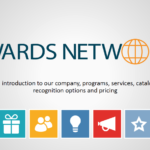 Description: Sales incentive and rewards programs added to a formal sales compensation plan can dramatically increase performance and boost profits, but putting together an incentive program can be overwhelming. 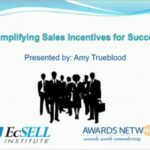 During this webinar we will share proven best practices in setting up a reward and recognition program for your sales staff and teach you how to motivate and excite your team. How to make a sales incentive program simple and easy to understand by separating and clarifying goals. How to take advantage of online tools and customization to simplify and automate the tracking and reporting. How to use email and other media to communicate the program to ensure everyone is engaged and working towards a common goal.